The ideal size and shape to blend into any environment, this IP65 rated gem is loaded with quality components and top-notch features. 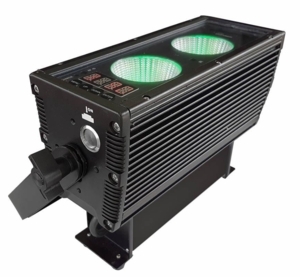 Blok 2™ IP fixtures come fitted with 2x high output 25W RGBW+UV 5-in-1 COB LEDs with a 30° beam angle, plus, it goes anywhere light is needed thanks to its internal Intelion™ lithium-ion battery system. Use them freestanding almost anywhere wirelessly and without power cords as an uplight, or, mount it via its secure dual mounting brackets! Blok 2™ IP fixtures come with a built-in wireless AnyFi™ receiver that supports W-DMX™ and our own Skywire™ 2.4Ghz wireless DMX protocol, so it can receive wireless DMX from any Blizzard transmitter such as our wiCICLE™ and Lightcaster™ products. The fixture has no fans due to its solidly constructed cast aluminum housing with heat sink that naturally dissipates any heat. It also has a tempered glass lens and watertight internal gaskets, which protect the light source, antenna, status LEDs, and the easy-to-use Micro OLED control panel with 4 touch sensitive electronic buttons.